APEX has teamed up with other health service providers so that you can get everything you need, all under one roof! We still have a couple of beautiful office spaces available! Please contact us to make an appointment to view the space! Lisa offers reasonable prices and evening availability! Call or Text for Your Free Phone Consultation Today! Laurie Markowski is a licensed massage therapist that has been practicing in NYS for 15 years. Educated at New York Institute of Massage and specializes in deep tissue, medical, pregnancy massages. Certified in the Raindrop Technique which is bodywork that unifies the spine and feet vitaflex points with essential oils. Believes that an educated client makes a healthy client and that bodywork should make the mind, body, and soul fulfilled and balancing the well-being completes an individual. Laurie Markowski is devoted to assisting you with achieving this goal of a healthy life. Boys on the Right Track , Inc. Boys on the Right Track , Inc. teaches life and leadership skills while training for a 5k. An after school program offered in Fall and Spring, 9 weeks long (1.5 hours/2 days of the week), appropriate for boys aged 8-13 and of varying physical abilities. 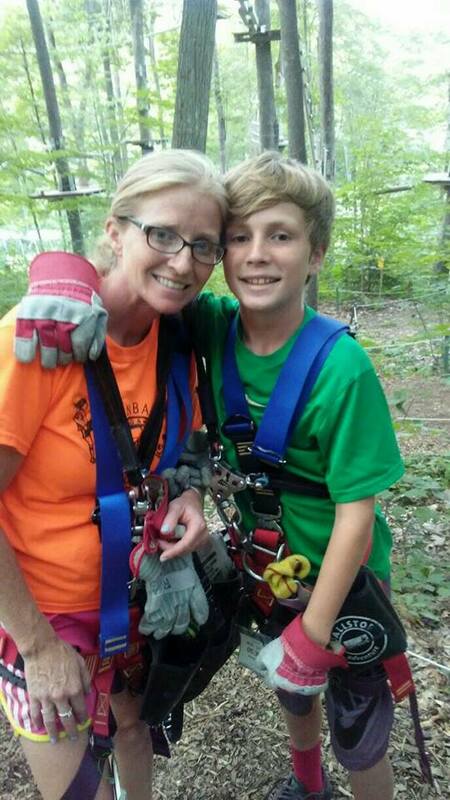 Specifically, boys learn through fun games, activities and running. The program encourages healthy behaviors and overall wellness, while teaching youth coping skills, how to effectively communicate, build healthy relationships, resolve conflicts, healthy nutrition, appreciate diversity and other important life and leadership skills. At the end of the nine weeks, boys learn about giving back to others and complete a service project. Problem solving, working together, learning a certain level of grit, goal setting are all behaviors learned that prevent drug and alcohol abuse. Furthermore, learning meditation, managing stress and anger and their emotions and how to handle bullies are behavioral outcomes. Results of participation are enhanced character, instilling confidence, learning how to resolve conflicts, and more life competencies.Therefore, allowing access to fitness, mental well being and socialization , all which are very crucial at this age. Formed in 2013, Boys on the Right Track has successfully provided life and leadership skills to thousands of boys.More than 30 percent of the participants receive financial assistance, more funding is needed to allow access to a greater number of boys that can not afford it and will benefit. Boys on the Right Track does not turn anyone away due to inability to pay. Rebecca Mcnamara is a health coach that will consult with you not only about nutrition but about how life balance plays a huge role in your journey to health and wellness success. She has free consultations right in the professional suites at APEX Health & Wellness. She will thoroughly and effectively explain how your lifestyle and priorities can dramatically affect your success as well as strategize what will assit you on this path to wellness. She is a compassionate and kind accountability and health coach and can finally bring you success with all of your wellness and life goals. You can reach Rebecca at 716-380-4615 or sunshinewellness75@gmail.com to once and for all change your life for the positive. 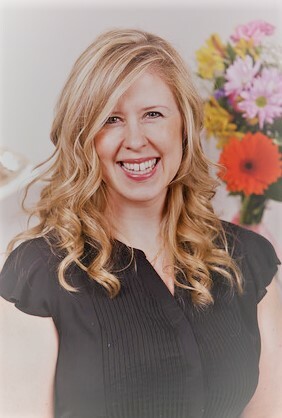 Kristen is a Reflexologist and Premier Essential Oil Educator please visit: www.kristenhelling.com to learn more about services and EO education classes or to book an appointment. Reflexology is a non-invasive complementary practice involving thumb and finger walking techniques to apply alternating pressure to reflexes shown on reflex maps of the body located on the feet. 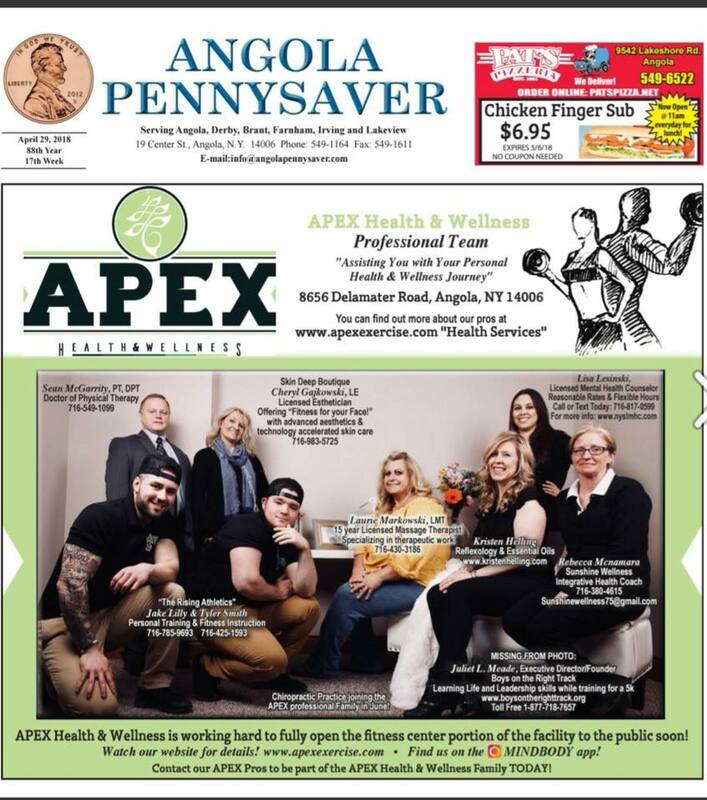 ANGOLA PHYSICAL THERAPY HAS TEAMED UP WITH APEX HEALTH AND WELLNESS FOR THE EXPRESS PURPOSE OF PROVIDING PATIENTS THE OPTION TO RECEIVE PHYSICAL THERAPY IN A FITNESS CENTER SETTING. IF YOU ARE AN INJURED ATHLETE, OR SOMEONE WHO WANTS TO TRANSITION FROM PT TO A FITNESS CENTER, YOU MAY WANT TO TAKE ADVANTAGE OF THE SPACE AND EQUIPMENT AT APEX FOR MORE FUNCTIONAL TRAINING. FOR AN APPOINTMENT AT OUR CLINIC LOCATION AT 8505 ERIE RD. OR OUR LOCATION AT APEX HEALTH AND WELLNESS 8656 DELAMATER RD., BOTH IN ANGOLA, NY. 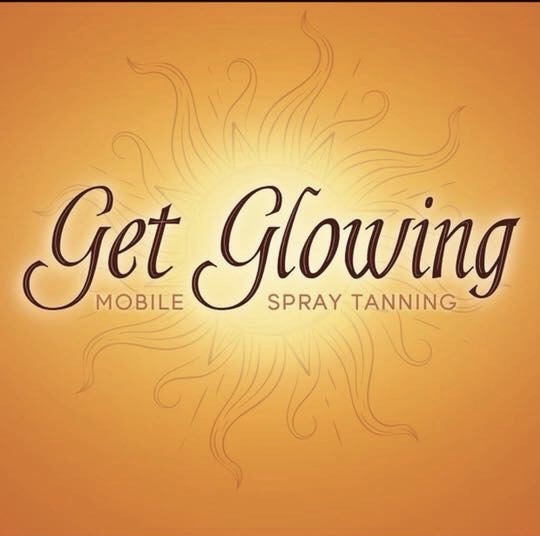 Dawn will help you achieve a beautiful, healthy glow with a customized spray tan. It is a safe alternative for a natural looking tan, without the harmful effects of UV rays! You can reach Dawn at 716-863-2010 or click the link below to get more information!